There's one degree of separation between Bruce Kessler, race driver and director of the 1962 film "The Sound of Speed," and James Garner. Kessler once directed an episode of the '70s TV show The Rockford Files, of which Garner was the star. But back to 1962. Kessler — acting as producer, writer and director — and his crew shot the groundbreaking The Sound of Speed at Riverside Raceway in California during 1961. It featured the Scarab car fielded by his friend and fellow driver Lance Reventlow, and as the story goes, the cameras and sound equipment had to be custom-fitted, a setup that influenced the on-board cameras of the nascent racing-on-TV era. 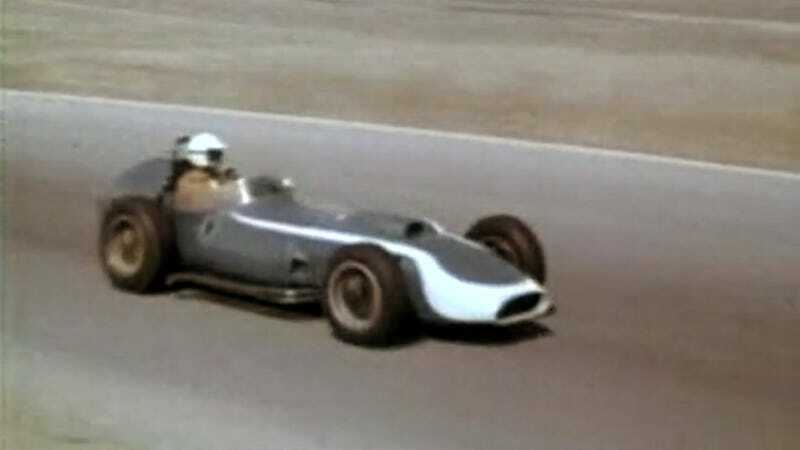 It's been said the Scarab shown in the film had been converted to Chevrolet V8 power (from its 2.5-liter, F1-standard Offenhauser mill) for "Formula Libre," a proposed loose-rules class that would have pitted a range of vehicles and powerplants against each other. It's also said that driver Chuck Daigh (seen doing the driving here) wanted to race at Indy, and convinced Reventlow to install the V8 in anticipation. Either way, that V8 provided a soundtrack that, when recorded using the latest techniques, thrilled audiences aurally, particularly at the Cannes Film Festival in 1962, where it represented America in the shorts category. Indeed, The Sound of Speed isn't a documentary. It's a narrative short that tells its story without dialogue, in the same vein as French filmmaker Albert Lamorisse's Oscar-winning short The Red Balloon from 1956. The story is man vs. machine vs. himself and his own base urges for speed and glory. Or something. This version is a bit crackle-y, but not too bad with a good set of speakers. If you want a better copy, we hear you may be able to order it from Green Mountain Motorbooks, the last known supplier of The Sound of Speed DVDs.